On August 12, a U.S. federal judge found that the New York Police Department had systematically violated the U.S. Constitution in the way it performed stops and frisks. Judge Shira Scheindlin’s 198-page opinion in the case, Floyd v. New York, is here. I’ve discussed the case in earlier posts (here and here), so an explanation of the judge’s opinion is important. Today, I’m going to talk about what the judge actually said in her opinion; there’s already a lot of misinformation out there. Tomorrow, I’ll discuss the remedies the judge has required: the actions that NYPD will have to take to bring itself into compliance with the law. First, the decision does not “outlaw” stop and frisk; it does not stop the NYPD from using this long-established tactic. The judge said, correctly, that stop and frisk is a legal and constitutional tactic that police may use; the U.S. Supreme Court said so in 1968, in Terry v. Ohio. But, the judge said, the police must obey some basic constitutional rules when they do so. That, she said, was the problem: the NYPD was using stop and frisk unconstitutionally, in violation of the Fourth Amendment right against unreasonable searches and seizures, by stopping people without the required reasonable suspicion: a very small amount of fact-based evidence pertaining to the individual person, but something the police lacked in many tens of thousands of these encounters. In that respect, the judge ruled, the NYPD “has a policy or custom of violating the Constitution by making unlawful stops and conducting unlawful frisks” (p. 3). Second, the judge made clear that she was not ruling on how effective the use of stop and frisk may or may not have been in fighting crime, either standing alone or in comparison with other police tactics for fighting crime. (See, e.g., p. 2), Rather, she said, she was ruling on whether the way stop and frisk had been used squared with the Constitution. …[T]he evidence at trial revealed that the NYPD has an unwritten policy of targeting “the right people” for stops. In practice, the policy encourages the targeting of young black and Hispanic men based on their prevalence in local crime complaints…While a person’s race may be important if it fits the description of a particular crime suspect, it is impermissible to subject all members of a racially defined group to heightened police enforcement because some members of that group are criminals. The Equal Protection Clause does not permit race-based suspicion. That’s the legal and constitutional basis for the judge’s decision that the time has come to reform the use of stop and frisk in New York. In my next post, I will discuss how the judge will require that reform to take place. The U.S. Department of Justice (DOJ), in partnership with the Innocence Project and the National Association of Criminal Defense Lawyers (NACDL), will review 2,000 cases in which microscopic hair analysis of crime scene evidence was conducted by the FBI Laboratory. The review, prompted by the DNA-based exoneration of several men convicted on the basis of hair microscopy, will focus on “specific cases in which FBI Laboratory reports and testimony included statements that were scientifically invalid.” The Innocence Project’s announcement of the review is here; a representative news article is here. Because of the importance attached to these cases, the DOJ has agreed, for the first time in its history, not to raise procedural objections, such as statute of limitations and procedural default claims, in response to the petitions of criminal defendants seeking to have their convictions overturned because of faulty FBI microscopic hair comparison laboratory reports and/or testimony. Translation: DOJ is not going to fight this review in any of these cases; they’re going to be part of it. Of course, this review will not affect cases in which hair analysis was handled by state crime labs. But here’s hoping they will take this as an example, as the Grits for Breakfast blog argues ought to be done in Texas. For a sense of the damage that sloppy hair analysis and testimony about it has done in prior cases, listen to this NPR story and interview about the case of Dennis Fritz, in Ada, Oklahoma. John Grisham’s nonfiction book “The Innocent Man” is an excellent read about the case. Maybe this is the beginning of a trend. Hats off to DOJ, the Innocence Project, and NACDL. A “Revolution” Favoring “Science and Pragmatism” in Criminal Justice? Tags: crime lab, failed evidence, failed forensics, faulty forensics, federal funding, forensic science, Laurie Robinson, NAS report, National Academy of Sciences, Office of Justice Programs, OJP, Strengthening Forensic Science in the U.S. When a former high-ranking Justice Department official speaks of a “revolution” in criminal justice, with the whole field turning toward science, could it mean less failed evidence in the future? What does it mean for those concerned with faulty forensic science? Robinson’s web page at George Mason says her tenure at OJP “was marked by a focus on science and evidence-based programming.” She was in Delaware to discuss the state’s re-entry programs and other initiatives to reduce recidivism, and few would disagree that those important programs need scientific and statistical support. But I wonder whether Robinson would be as optimistic about science’s role in forensic methods, which have played a role in about half of all wrongful convictions across the U.S. Surely, forensic science needs “science and evidence-based” support and examination — badly. It has now been more than four years since the release of the landmark 2009 National Academy of Sciences report Strengthening Forensic Sciences in the United States: A Path Forward, which found that except for DNA and chemical analysis, most of what we think of as forensic science isn’t science at all. In that time, little seems to have changed; scandals in crime labs continue to pile up in jurisdictions across the country (see my posts about lab scandals just this past year in Massachusetts and Minnesota, for example). In a particularly compelling piece of writing in the Huffington Post, Radley Balko discusses the long-running crime lab scandal in Mississippi, and puts it in context: Mississippi’s scandal “is just the latest in a long, sad line of such stories” that Balko has already chronicled. What’s to be done? 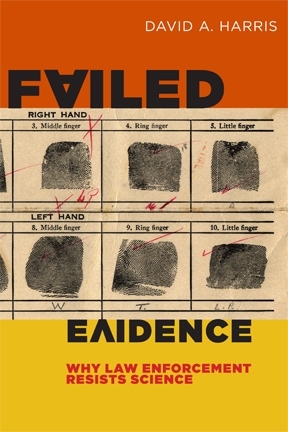 As a start, I argued in chapter 7 of Failed Evidence, all federal money that goes to law enforcement should carry with it a requirement for compliance with best practices in police investigation and forensic science. Not all law enforcement agencies run their own forensic labs (and as the NAS report said in Chapter 6, “Improving Methods, Practice, and Performance in Forensic Science,” labs should be independent of law enforcement.). But for those that do, compliance with standards that would avoid systematic error, human biases, fraud, and improper scientific testing and testimony should be mandatory. That would start a revolution right there. Because what law enforcement agency could afford to just turn down federal funding, in budgetary times like these? Bite-Mark Analysis: Junk Science or Just A Few “Bad Apple” Practitioners? Tags: American Board of Forensic Odontology, bite mark analysis, bite mark identification, certification, DNA, failed forensics, forensic dentistry, forensic odontology, forensic science, NAS report, National Academy of Sciences, Strengthening Forensic Science in the U.S.
Of all of the methods studied in the 2009 National Academy of Sciences’ report on forensic science, forensic odontology — the analysis of bite marks to identify the perpetrators of crimes — has come under some of the harshest criticism. And now an effort is underway to keep it out of courtrooms for good. This article by the Associated Press examined “decades of court records, archives, news reports and filings by the Innocence Project in order to compile the most comprehensive count to date of those exonerated after being convicted or charged based on bite mark evidence.” Typically, the evidence consisted of testimony by forensic dentists identifying marks on the bodies of victims (usually in cases of murder or sexual assault) as coming from the defendant’s teeth. According to the AP, since 2000, DNA identification has overturned one after another of these cases, throwing the entire “discipline” into question, and rendering it nearly obsolete. Critics make two main claims against forensic odontology. First, there’s no scientific proof that a bite mark can be matched to any particular set of teeth. There is no data, no experimental evidence — nothing — on which to base the idea that forensic odontology can make reliable identifications. Second, human skin — almost always the site of the bite mark in question — does not reliably “record” bite marks, since the skin itself changes over time, even after death. Because the skin changes shape, consistency, color, and even size after the mark is made, this makes bite marks, and the method itself, inherently unstable. Only about 100 forensic dentists are certified by the odontology board, and just a fraction are actively analyzing and comparing bite marks. Certification requires no proficiency tests. The board requires a dentist to have been the lead investigator and to have testified in one current bite mark case and to analyze six past cases on file — a system criticized by defense attorneys because it requires testimony before certification…The consequences for being wrong are almost nonexistent. Many lawsuits against forensic dentists employed by counties and medical examiner’s offices have been thrown out because as government officials, they’re largely immune from liability. Only one member of the American Board of Forensic Odontology has ever been suspended, none has ever been decertified, and some dentists still on the board have been involved in some of the most high-profile and egregious exonerations on record. It’s worth noting that there’s nothing wrong with other uses of forensic dentistry, such as identifying human remains from teeth by matching them to existing dental records; that type of forensic work is generally rock solid and remains unchallenged by critics. But on identification of perpetrators through bite mark analysis, the question is different: when a forensic “science” has as dismal a record as forensic odontology does, and no scientific proof of its validity exists, can anything justify allowing the use of bite mark evidence to convict a person of a crime?